Over the last nine months HERA and CTICM have developed software to design composite columns using concrete filled tubes according to AS/NZS 2327. We’re excited to announce that the design software is now exclusively available for our members. This came to fruition when our Steel Research Panel identified it was important to develop electronic tools to support AS/NZS 2327 to allow our membership to better exploit the benefits of this standard. Particularly given the recent amendment to B1/VM1 of the Building Code. 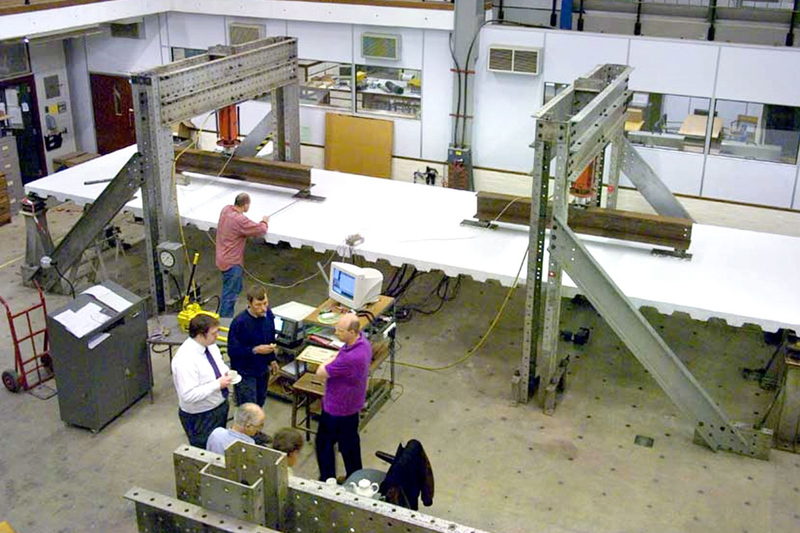 10m span composite beams being loaded to failure at Cambridge University, United Kingdom. Structural hollow sections are the most efficient of all structural steel sections in resisting compression. They have a high strength to weight ratio and produce slender attractive lines that make them a natural choice for building structures. In addition, structural hollow sections can achieve a constant external dimension for all weights of a given size, which enables them to achieve standardisation of architectural and structural details throughout the full height of the building. By filling hollow sections with concrete a composite section is produced, which will increase the section’s room temperature load carrying capacity, whilst retaining all the advantageous features of the basic unfilled section. Alternatively, for the same original load capacity, it permits smaller composite sections to be used. The reduction in section size also gives advantages in subsequent construction processes, including a reduced surface area for painting or applied fire protection. Composite columns using concrete filled tubes perform very well when subjected to seismic loading, due to the deformation of the steel section being prevented by the concrete infill which, in turn, is confined by the steel tube. As a consequence, concrete filled tubes exhibit high stiffness, strength, ductility and energy absorption under cyclic loading. The suitability of concrete filled tubes in seismic areas was clearly demonstrated by the good performance of this technology during the 1995 South Hyogo earthquake in Japan. By accounting for the reduced resistance and stiffness of the steel, concrete and reinforcement (when included) at elevated temperatures, composite columns using concrete filled hollow sections may be designed without applied fire protection – significantly reducing building costs. Fire design rules for composite columns using concrete filled hollow sections are provided in AS/NZS 2327. Level 2 Simple calculation models. Level 3 Advanced calculation models. The Level 1 tabulated rules provide composite column cross-sections to achieve a fire resistance rating (FRR) of 30, 60, 90, 120 and 180 minutes. The columns are classified as a function of the load level for fire design hfi,t, the cross-section size (b, h or d), the geometric reinforcement ratio of the longitudinal reinforcement ρl (=As / [Ac+As]) and the minimum axis distance of the longitudinal reinforcing bars us. However, use of the tabulated rules can be very restrictive. More efficient designs can be achieved using the Level 2 simple calculation models but, although ‘simple’, the amount of design effort required can be considerable, thereby sometimes providing a barrier to the uptake of this technology. As a benefit to our Members, the Level 2 simple calculation models have now been automated through the new design software. Currently, the AS/NZS 2327 rules permit unprotected composite columns to be designed to achieve an FRR of up to 120 minutes. In future editions of AS/NZS 2327, it is hoped that this FRR can be further extended through recent research work that has been undertaken at the University of Auckland. In some rare cases, composite columns may be outside the scope of the Level 2 models (e.g. FRR in excess of 120 minutes, high slenderness, high load eccentricity, etc. ), such that Level 3 Advanced calculation models may be necessary. In these circumstances, we’ve had a long history of assisting our members using FEA capability. AS/NZS 2327 is the first joint NZ & Australian design standard for steel-concrete composite multi-storey buildings. That’s why this collaboration with our international partner CTICM to develop software aligned to it, to design composite columns in both normal and fire conditions has been so important. 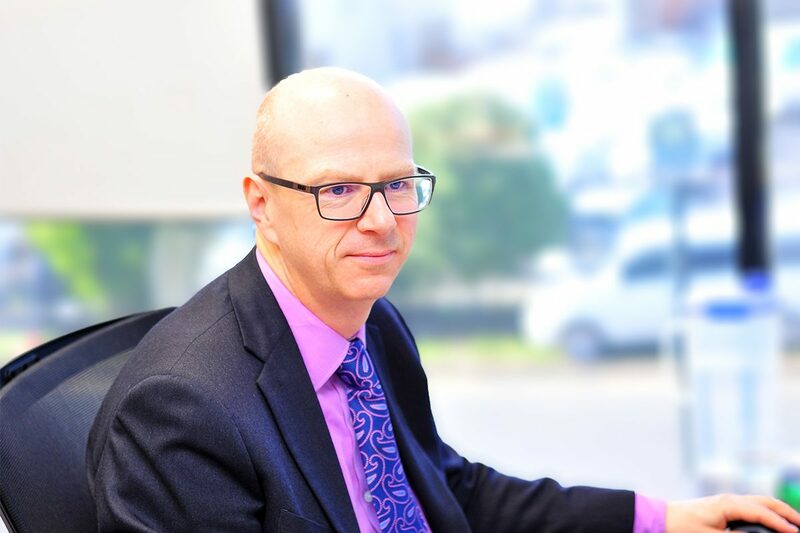 If you’d like to know more about our activities in developing standards and electronic design tools to ensure our New Zealand steel sector remains competitive in the global market, please contact our Structural Systems General Manager Dr Stephen Hicks. Are you a member? Contact our librarian to gain access to the software.